Kibuki : an experiment in possession, trance, and the meaning of healing. A poem film. 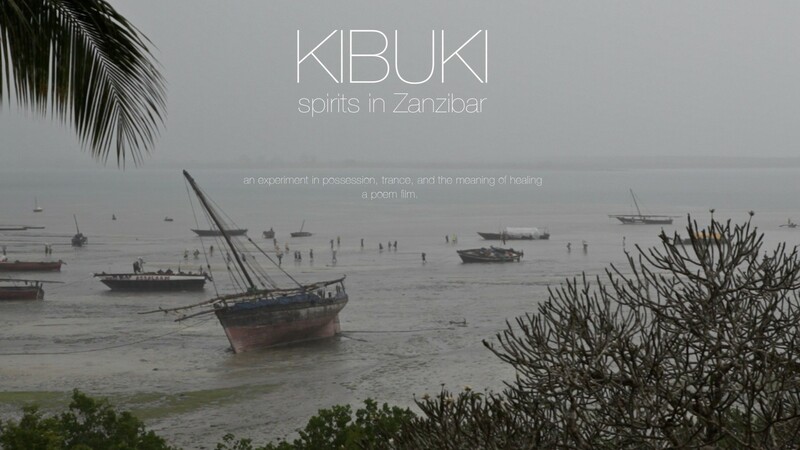 KIBUKI: SPIRITS IN ZANZIBAR is a 25 minute film made during a 15-month cultural immersion with the Reggan Kibuki healing collective in Kilimani, Zanzibar. Swahili spirit possession is a medical philosophy in which invisible creatures enter our bodies and transform us. Our skins are not solid membranes and an event that occurs outside the body—particularly a trauma— may enter and disrupt the self. I was attracted to this philosophy for personal reasons; I have struggled with depression and I experienced a traumatic event during the filming process when a close friend was killed in an auto accident. In making KIBUKI, I worked collaboratively with Asha and Osman Reggan, who appear in the film. They suggested that for my own well being, I should participate in the ritual, and we decided to film my induction. In a series of ritual treatments, my body becomes the site and the object of our exchange. Asha and her assistants, Shadia and Abedi, joke about American hegemony and the presence of the camera while they translate belief in possessing spirits, and explore its application to a white and foreign person. In addition to the film, I wrote an academic essay about the experience, and I curated a selection of short videos from the project archive. Thank you for taking the time to explore the Kibuki project. For more information about my work, please visit my artist website, Elizambrooks.com.